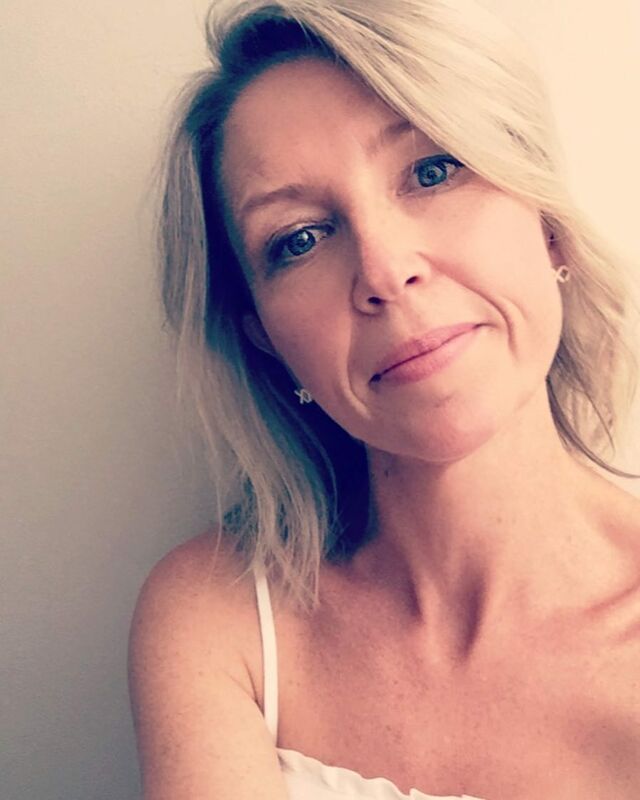 Isn’t she lovely? Photographing her proved a little difficult also, but I took the small window of hope I had this afternoon and pinned her up! After I trimmed her down, this beauty ended up being 88″ x 70″. It was a funny lesson in grabbing as many rulers as I could find and lining them up, before drawing a line to cut! Fun. And. Games. I quite simply ADORE the way the colours have ended up melting in to one another. I sent this baby off to a lovely quilty friend of mine, who has her own little business. 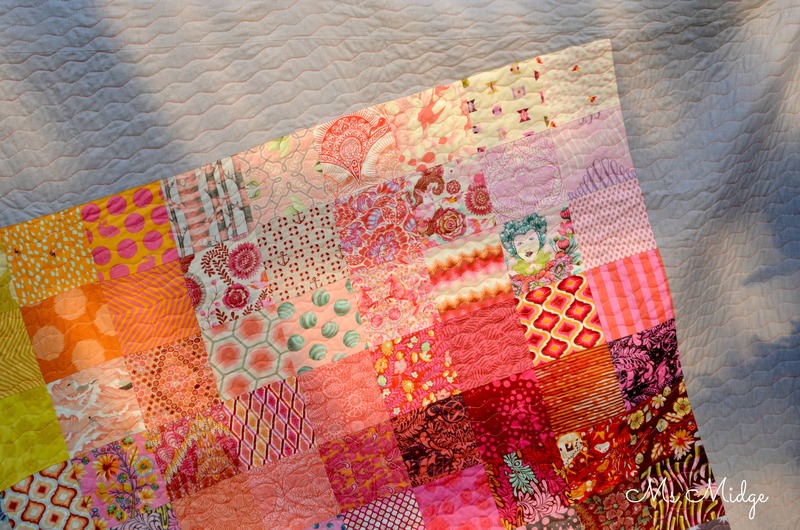 Quilty Carlie uses both her longer machine and/or her domestic to provide gorgeous quilting designs. We kept it super simple on this one, with a wavy “serpentine” stitch, with the rows about one inch apart. It adds SO much texture, it’s not even funny. ALL the pinks and oranges! LOVE! 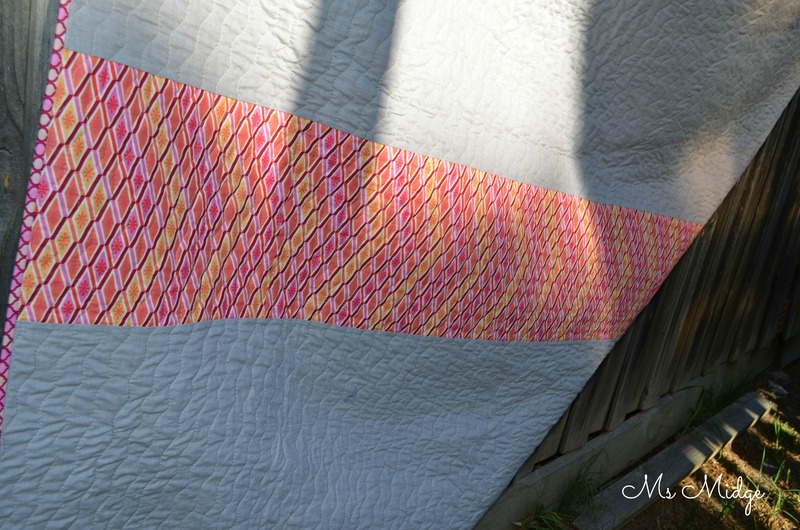 I chose to use the two amazing variegated thread colours in February’s #aussieaurifilclub bundle – Watermelon Summer! I’ve tried to get photos that give the colours justice, they are just sublime. And this is my hilarious attempt at showing you the backing! I’m very proud to say I pieced that centre section bloody perfectly!!! So. 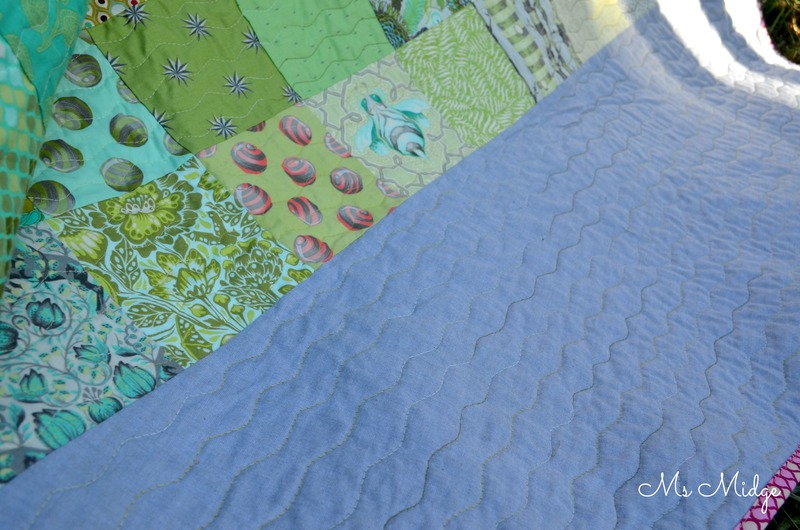 Where is this big mother of a quilt going to reside? Well, I’m actually gifting it to someone! And I’m hoping they REALLY LOVE IT! 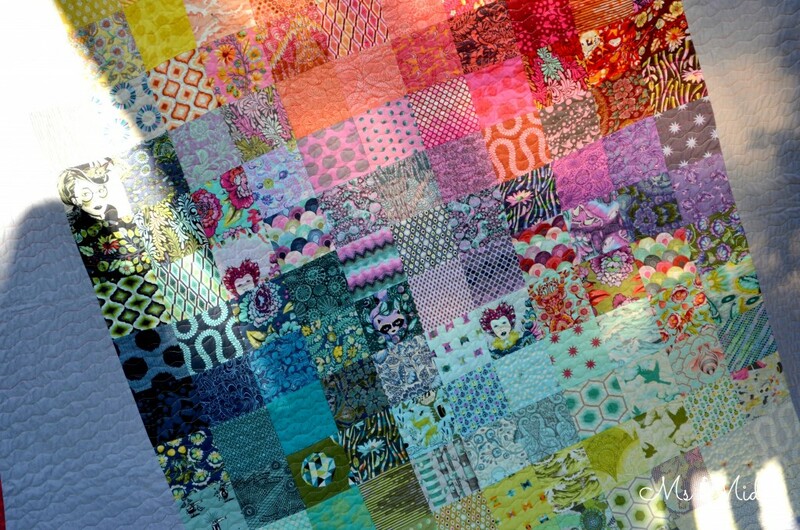 I’m using Tula Grande as another example of how a simple layout of 5″ squares can have maximum effect! But also an example of how a simple idea of “hey, i’ll just offset this centre section on to a background” can give you a HUGE quilt! Hahaha! 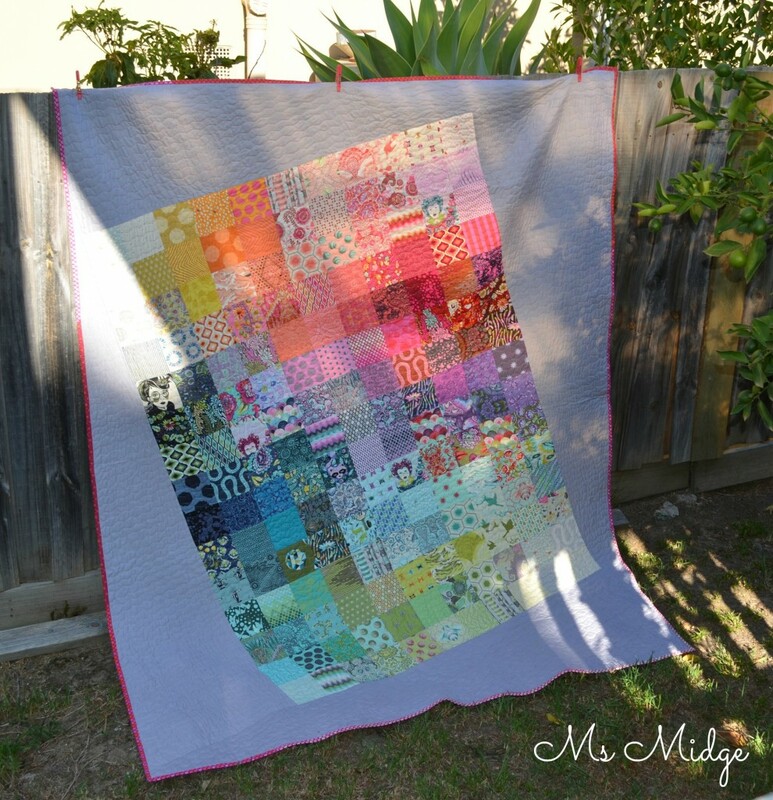 It’s gorgeous Ms Midge!! You must be very proud of it! Huge sure is the right word! As is bloody beautiful 😀 Quilty Carlie, ‘eh? Noted! Boy do I love all that rainbow goodness! Beautiful finish! Having the center off set is a fabulously effective idea! i’m a tula fangirl lol but I’ve been hoarding it not using it, but this year i’m planning something, don’t know more than its scrappy and uses lots of bits. 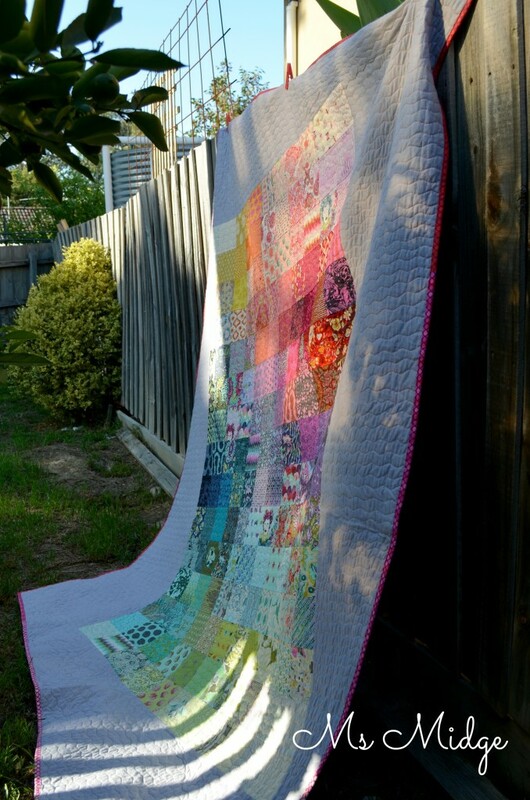 your quilt is very inspirational, love the bigness and the way you framed it, wonky, brilliant. I love seeing how all her collections play together, I have enough of her fabric to make quilts for years, lolol you must to because I don’t think I saw a repeat in it. very gorgeous. I like the fact that you took just simple squares and made a big impact simply by setting the design at an angle. The color graduations are just lovely. Congrats on your finish – I’m sure your friend will be over the moon thrilled with such a great gift! 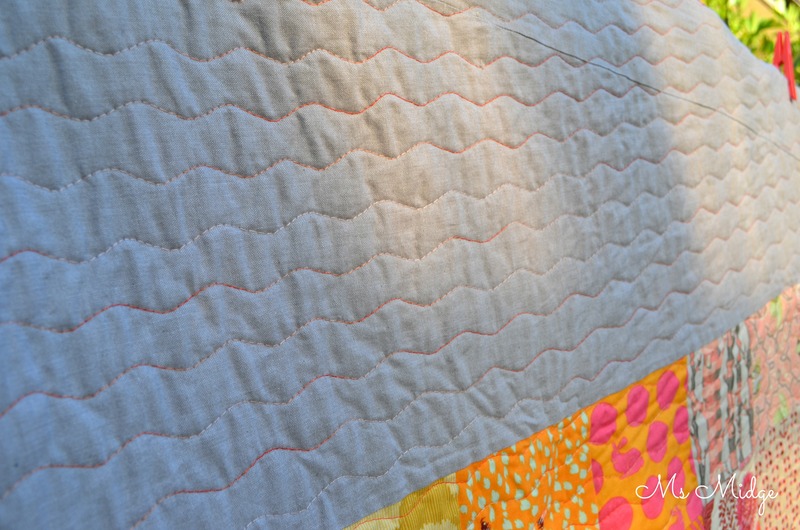 The quilt beautifully showcases the fabrics and the modern twist is just great! Congrats on the finish and I hope the new owner will love it! That is an EXCELLENT way to make something bigger. And the rainbow gradient effect is pretty great too. WOW, WOW, WOW it is simply beautiful and if the person who receives it doesn’t love it, bop them on the head and take it back and send it to me (hehehe). I think it is beyond awesome!! !